Rumblings about a possible future attack on America’s power grid and logistical infrastructure have some politicians in a scurry trying to figure out how to prevent it. According to reports, North Korea currently operates two satellites that cross over the U.S. in what experts say are just the right patterns and altitudes for triggering an electromagnetic pulse, or EMP, that would completely cripple the nation’s power grid. Tensions between the U.S. and Kim Jong-Un’s communist regime have escalated in recent weeks after the erratic dictator reportedly tested his country’s first solid-fuel missile. It was an unprecedented event from the perspective of the West, which was caught off guard by the notion that North Korea is apparently ready to launch a real missile at any moment, and with little to no warning. Dr. Peter Vincent Pry, executive director of the Task Force on National and Homeland Security, warns that North Korea could be planning to launch an EMP attack against the U.S. in the very near future. If successful, millions of people across North America could die, as all electronics would be instantly destroyed. The result would be no more food production, no more computers, no more clean water, and no more energy. According to Dr. Pry, who also sits on a Congressional committee regarding the issue, the threat represents a “cyber-age version” of battleship diplomacy. What he means by this is that North Korea has positioned its satellites in such a way that either one of the other is “very close to being over the United States” at any given time, he told the U.K.’s Independent. While North Korea’s satellite program is said to have officially began back in the 1980s, it wasn’t until about five years ago that the regime successfully launched its first observation satellite. In 2016, it launched its second, and both of these are able to make a complete orbit of the earth in about 94 minutes. With this constant threat literally looming overhead, Dr. Pry believes that North Korea may use it as a bargaining chip should the U.S. threaten to carry out military sanctions against the nation. This is especially true now that President Trump has promised an end to the Obama-era policy of “strategic patience” with North Korea. The President has indicated that his administration will deal with the problem head-on, “with or without” China’s help. 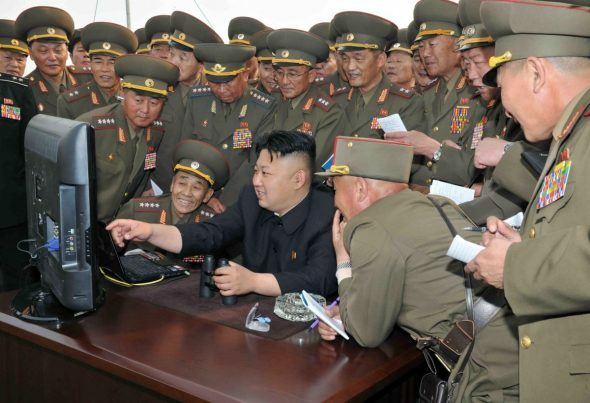 But Jong-Un has promised his own retaliatory action, should the U.S. attempt anything against his regime. Officials in Pyongyang say their country isn’t the problem, but rather President Trump and the nation he leads. Dr. Pry isn’t convinced, though. He believes that North Korea’s rocket tests looked “suspiciously like practice for an EMP attack.” Plans drawn up by the former Soviet Union during the Cold War era is where Dr. Pry believes North Korea is getting its inspiration for a possible future EMP attack against the U.S. At the same time, President Trump says his administration is fully prepared to neutralize this threat.